This ad has been favorited 623 time(s). 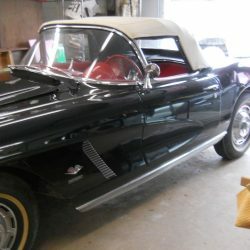 1957 Corvette Convertible Black/Silver Coves With Red Interior, 283/245HP Motor Period Correct With Dual Quad Carbs. 4-Speed Transmission, 3:55 Posi. Rear-End, New Black Top, Older Restoration Approx. 10 years Ago, Solid Frame, No Hit Body, Runs Great, 70,000 Documented Miles, All Chrome Is In Very Good Condition. Contact Us For More Info.